MIDITECH Review 2019: Is MIDITECH a Good Hosting? Miditech is an Indian web hosting company founded in 2010. It features ISO 27001 certified server centers in Delhi and Mumbai, India. Hosting plans come in shared Linux, Windows, VPS, and dedicated options. 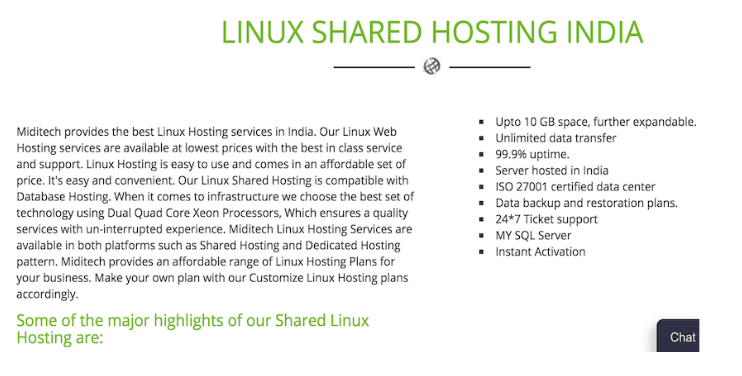 Since 2010 India-based Miditech has provided personal and business users with shared Linux and Windows, VPS, dedicated server, and reseller hosting. Its server facilities are located in Delhi and Mumbai, India and are ISO 27001 certified, and its website is in English. Entry-level shared Linux hosting plans begin with 500MB and increase to 10GB of storage. These same data levels can can also come with a Windows server instead. Online stores are growing in popularity every year, and Miditech provides support for popular shopping cart integrations, such as: CubeCart, OS Commerce, and Zen cart. These can be added to your site with one click. Data allowances for E-commerce plans are the same as Linux and Windows options. All shared hosting plans also come included with unlimited bandwidth and email addresses. Whether you run a personal or business website, you won’t run out of data or the ability to feature separate email accounts. Advanced users can upgrade their hosting to Linux or Windows VPS, dedicated power, or dedicated enterprise server. VPS plans come with 1GB-8GB RAM, 20GB-100GB HDD, and one-four CPUs. Power and enterprise dedicated server plans are packed with performance features and meant to handle the most demanding tasks. Pricing for Miditech’s hosting plans is very competitive compared to other top global providers. The entry plan costs relatively little, however, the amount of storage that comes with the low price is not much compared to a few of the top web hosts in India who offer unlimited storage and email addresses for not much more money per month. For a customer with simple hosting needs, Miditech’s low-cost plans will likely be suitable. If your data needs are greater, it may be worth checking out some of the competition’s unlimited plans if you are going to be paying more anyway. Payment for Miditech’s hosting is flexible in that you can choose different lengths of plans. For shared hosting, you have the option of paying for either one, two, or three years up front. For VPS and dedicated plans, you may pay monthly, quarterly, biannually, or annually. Miditech’s customer support is handled via telephone, live chat, email, and ticketing. It features round-the-clock support for customers. My email to customer service with sales questions was handled within a couple of hours and the response was courteous. Miditech is an Indian web host providing decent hosting plans for personal or business users. It has a solid uptime guarantee along with a number of features that customers will be happy to have. Pricing starts very affordably, however, for more data allowance, you may prefer some of the competition, who offer potentially more value for the money. Wondering how MIDITECH stacks up against other Web Hosting companies? Enter any other Web Hosting company and we will give you a side-by-side comparison.